We can't survey flights for August 2019 yet as they aren't available. We will get around to surveying them closer to the travel dates. August is Women's Month, with Women's Day taking place on Thursday the 9th of August 2018. This creates the perfect opportunity for an extra-long weekend if you can take leave on the Friday. It seems like many are taking full advantage of this, as the flight prices are incredibly high around these dates. Travellers on a tight budget would be better off avoiding travelling on the 9th and 12th of August 2018. 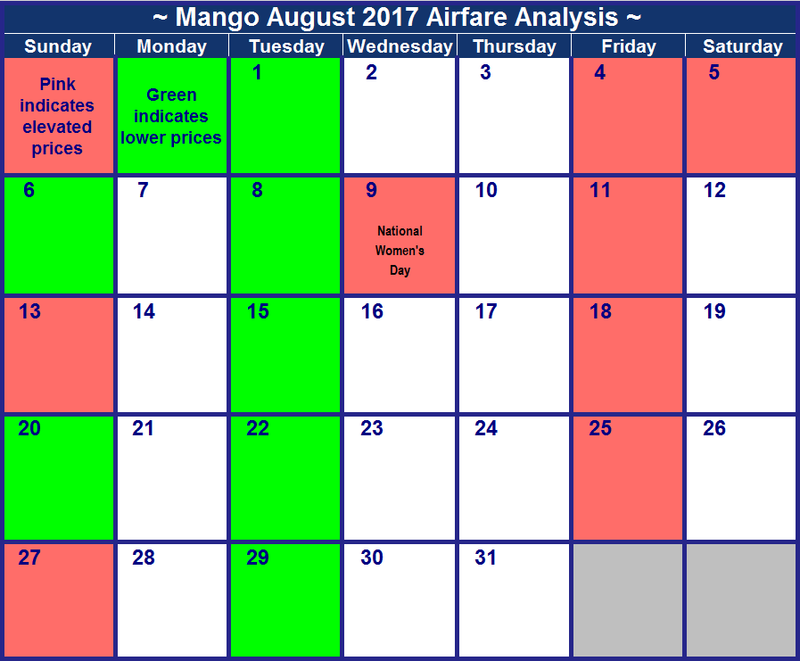 More affordable flights can be found during the first week of the month, although it is best to look out for dates highlighted in green on your respective route. Avoid travelling on the 8th and 12th where possible as this would make for a very expensive long weekend. Travellers on a tight budget should consider travelling during the first week of the month when flights are cheapest. Affordable flights are readily available throughout the month, with only the 8th and 12th to avoid where possible. Cost conscious travellers should avoid travelling on the 12th where possible as flight prices are inflated to above three times the normal airfare. The first five days of the month are the cheapest to travel on. Thereafter flight prices increase slightly. Although there is a slight flight price increase after the first week, the prices are generally still affordable with the exception of dates highlighted in pink. Travellers should avoid the 8th, 9th and 10th of August 2018 as those dates are the most expensive to travel on with flights more than double the standard air fare. Dates highlighted in pink should be avoided as those are the most expensive dates to travel on. The first two weeks are the most affordable dates to travel on. If you are planning a long weekend, try to avoid ending it on the 12th as flight prices are very expensive on that date. 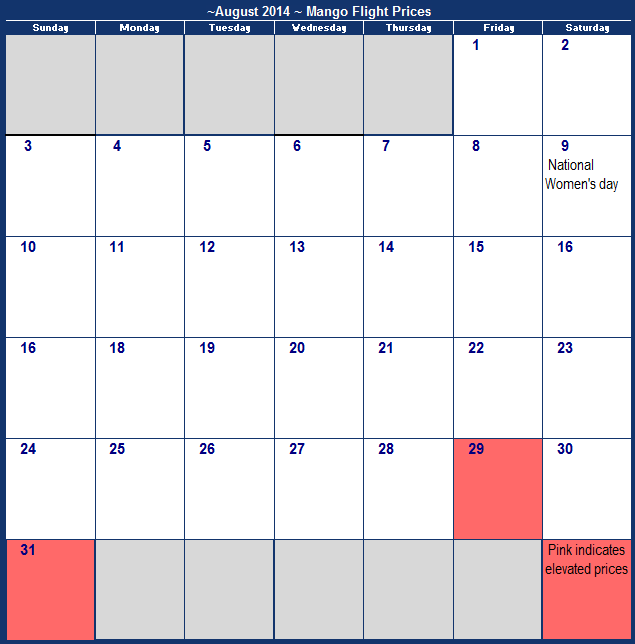 Affordable flights are readily available, although dates highlighted in pink should be avoided where possible. Flights around Women's Day are very expensive, so budget-conscious travellers would be better off travelling on the 11th or 14th. With the school holidays now only a distant dream and the cold setting in, August can be quite a dreary month. Luckily there is a public holiday, National Women's Day, on the 9th to break up the month. This year Women's Day is on a Wednesday, creating a nice mid-week break. Although flight prices are slightly elevated on this date for most routes, the fact that it doesn't create a long-weekend means that it is not as expensive to travel on as some other public holidays. Flight prices are also slightly elevated on Fridays and Sundays on most routes, for those taking a weekend break. Otherwise flight prices are fairly consistent on most routes, with the best chance at an affordable fair being on Mondays to Thursdays. Avoid travelling on the 11th, 13th, 18th and the 25th as those are the most expensive dates to travel on. Affordable flights can be found throughout the month, with most expensive flights found around the weekend, especially on the 13th. Affordable flights are readily available during the week and on Saturdays. Prices increase on Fridays and Sundays. Affordable flights readily available throughout the month, the cheapest being at the end of the month. Although Fridays and Sundays are slightly more expensive, but the only date to avoid if you're on a tight budget is the 9th. If you are on a tight budget, we'd recommend you travel between Mondays and Thursdays as those are the most affordable. Travelling on Fridays and the 9th of the month is a bad idea if you are on a budget. Look out for dates highlighted in green if you are on a budget as those are the most affordable dates to travel on. Flight prices are relatively stable, with flights on Sunday being slightly more expensive. Affordable flights on this route are readily available. Try to avoid flying on Fridays and Saturdays where possible. Sunday flights are generally more expensive than those available during the rest of the week. 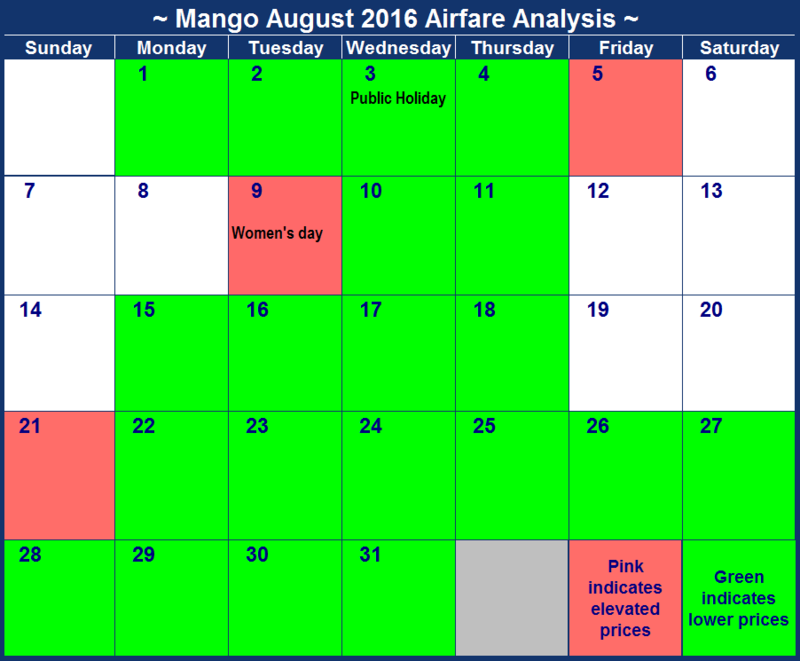 Mango flight prices during August are generally elevated during the first two weeks on most routes. This can be attributed to multiple public holidays, including a voting day on the 3rd, Women's day on the 9th and a school holiday on the 8th. As many might choose to make it long weekend out of the public holidays, flight prices are elevated around those dates. Cheaper flights are generally more readily available throughout the second half of the month. Avoid travelling on the 4th and 5th of August as those are the most expensive dates to travel on. Affordable flights can be found throughout the month, with most expensive flights found around the weekend. Weekdays are your best bet for finding very affordable flights. Women's Day is the most expensive day to travel on this route, with affordable flights readily available. Don't plan on travelling over the weekends if you are on a stringent budget as flights are more affordable mid-week. Budget conscious travellers might want to take note of the 1st and the 5th, when very affordable flights are available from Durban to Johannesburg. Travelling during the week of the month is a bad idea if you are on a budget. Rather travel during the rest of the month. Flights are fairly expensive on this route throughout the month, presumably as availability is limited. Flights are slighly more expensive on Sundays, but generally affordable throughout the month. Flight prices are relatively stable, with flights on the 7th being the most expensive. Tuesdays are the most affordable days to travel on. Sunday flights are generally more expensive than those available during the rest of the week, but you should try to avoid travelling on the 9th where possible. The cheapest flights are available on Mondays. The last two weeks of August are the most expensive on this route. We have to love the South African government, because they have provided us with the only public holiday in the month of August this year. Eventhough the 9th of August, Women's Day, falls on a Sunday we're getting an extra public holiday on the Sunday. That is however the only public holiday this month. Prices are slightly elevated around that date. We found the most affordable prices on most routes were generally around te start of the month. Prices below were surveyed on the 5th of June 2015. The more time that has passed since, the more likely it is that prices would have changed. Avoid flying on the 21st, 22nd and 23rd of August as those are the most expensive dates to travel on. If possible, try to travel on the 2nd or the 12th when flights are very affordable. Prices are very consistent throughout the month, with the 6t and 7th being the most expensive. The cheapest price of R878* is readibly available with selected dates here and there that are more expensive. Tuesdays, Wednesdays and Saturdays are the cheapest days to travel on this month. The only date to avoid this month is the 7th. Avoid travelling on dates highlighted in pink as they are the most expensive. Aim to travel on dates highlighted in green as those are the most affordable. Avoid travelling on Sundays and Saturdays as those are the most expensive days of the week. 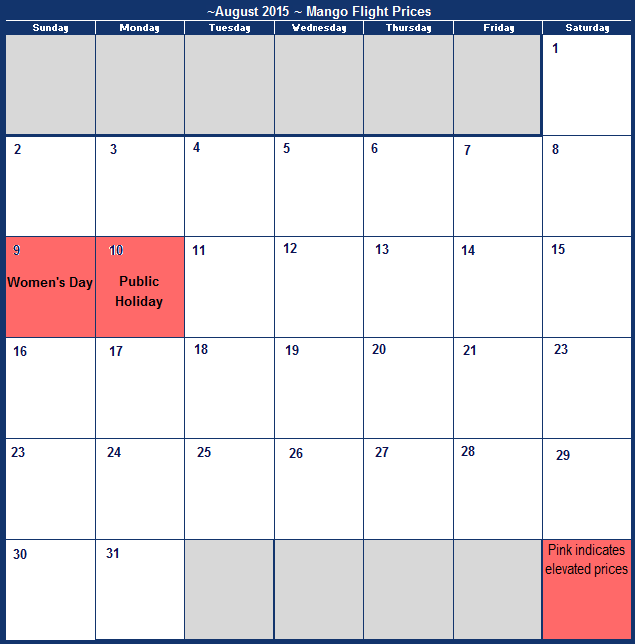 August has only one public holiday, International Women's day, which falls on the worst date possible - Saturday the 9th of August 2014. The 29th and the 30th of August are the most expensive dates to depart on. 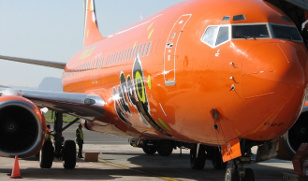 Bookings for Mango August 2014 flights qualify to earn SouthAfrica.TO travel vouchers. Email a writeup of your trip to cheapflights@southafrica.to and we'll send you vouchers. Photos & higher quality writeups get bigger vouchers. This survey was performed on the 23rd of April 2014. The longer the length of time since this page was updated, the greater the probability that airfares have changed from the below. Current airfares may be found at Mango. For more information about the airline's flight specials navigate to our Mango flight prices page. Flights that depart on the 10th are the most affordable. Avoid flights that depart on the 24th, as the prices on that date are elevated. The 12th, 17th, and 21st are the most expensive dates to depart on. Prices on this route are reasonably stable,except for the 3rd and the 31st. The 1st, 8th, 15th, 22nd and 29th are the most expensive dates to depart on. Try to aim for the highlighted dates, as they are the most affordable. Aim for the dates that are highlighted in green, as they are the cheapest dates available on this route. The 24th and the 31st are the most expensive dates to fly on. Prices on this route are stable, except for the 15th and the 31st. Try to aim for the 15th as this is the most affordable date. Flights on the 31st are the most expensive for this route. Flight prices for this route are quite high, but the highlighted dates are the most expensive. Prices on this route are more expensive than other routes. Aim for flights that depart on the 4th, 11th, 18th or 25th. These are the most affordable dates. Flights during the final two weeks of August are cheaper than those during the beginning of the month.